With a similar capacity battery to the original Llano laptop, and the same size 14” panel, Trinity comes out of the gates and posts two clear wins: idle battery life and Internet battery life are both up substantially relative to Llano. 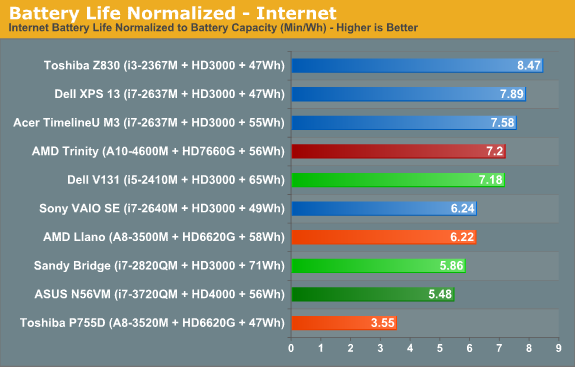 In fact, looking at the normalized charts, the only laptops that can consistently beat Trinity are found in Sandy Bridge ultrabooks—we won’t even bother discussing Atom or Brazos netbooks, as they’re competing in a completely different performance bracket. In something of a surprise, H.264 battery life doesn’t see the same benefit unfortunately, and it’s the one discipline where Llano still holds on to a slight lead over Trinity. 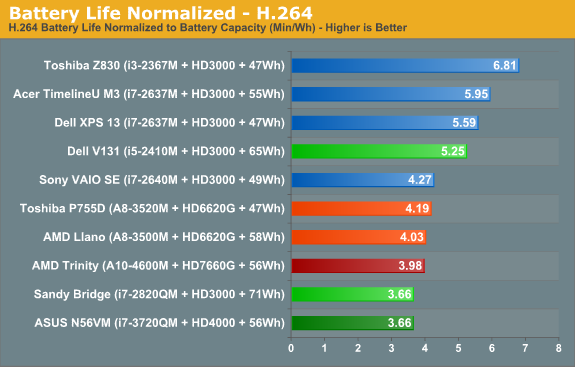 Sandy Bridge meanwhile has always done very well in H.264 battery tests, and we see that with the Vostro V131 posting a normalized score that’s 30% better than Trinity and Llano. 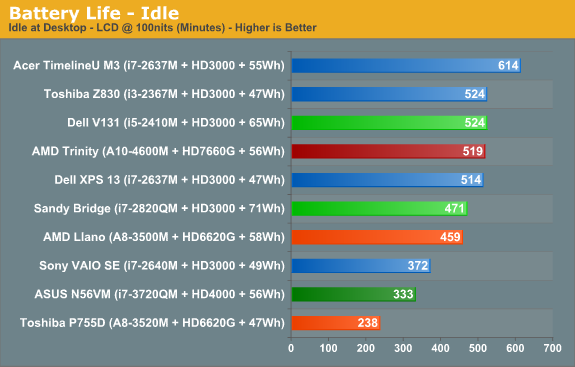 Of course, on the other end of the spectrum we have Ivy Bridge; we’ve only looked at one Ivy Bridge laptop so far, but if the pattern holds than Ivy Bridge will generally be a moderate step back in battery life relative to Sandy Bridge, giving AMD an even larger lead in this area. We also performed a few other tests that we won’t present in graph form. One set of tests we alluded to earlier: the charts show Trinity with a Samsung 830 SSD, but we also ran tests with an Intel 520 SSD. Idle battery life dropped to 476 minutes (an 8% decrease), Internet battery life checked in at 371 minutes (down 8% again), and H.264 battery life stayed nearly the same at 217 minutes (down less than 3%). If battery life is one of your primary concerns, remember: all SSDs are not created equal! Another test that we ran is simulated gaming; we looped the four graphics tests in 3DMark06 at 1366x768 until the battery ran out. 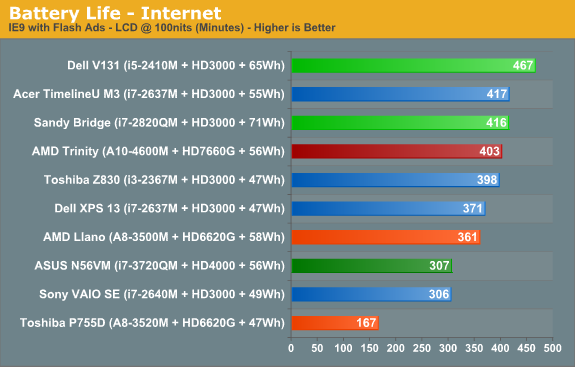 We’ve run this same test on quite a few other laptops, and Llano initially looked to be far and away the best solution. Later, we discovered that when we tested Llano we were letting the GPU run in power saving mode—basically half the performance you’d get compared to being plugged in. We retested and measured 98 minutes, so the extra graphics performance comes with a heavy cost. 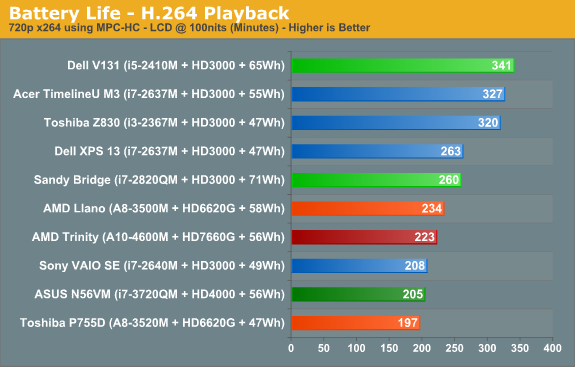 We only tested Trinity (and Ivy Bridge and Sandy Bridge) using higher performance graphics settings, and this is one more area where it scores worse than Llano: Trinity managed just 77 minutes. That’s about the same as Ivy Bridge and Sandy Bridge (79 and 73 minutes, respectively), so if you’re after better gaming performance while running off the mains, you might need to keep looking. Before getting too carried away with the above results, you still need to consider how important battery life is for your usage model. Some people travel a lot and like to go all day without plugging in; others will go from place to place and plug in whenever they’re not on the go. If you fall in the latter category, battery life isn’t usually a problem with any decent laptop, while those looking for all-day computing will definitely want as much mobility as possible. Ultimately, battery life is a factor of battery capacity as well as power optimizations done by the OEMs. 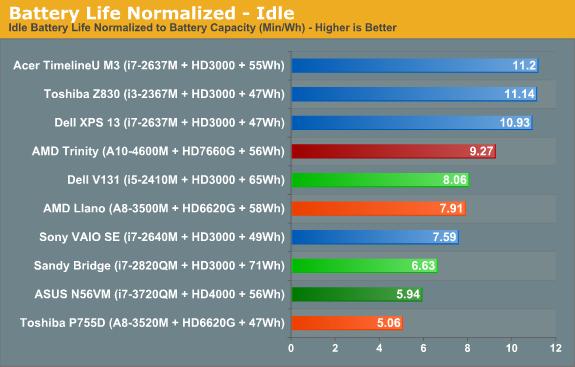 We’ve seen battery life improve by as much as 50% when comparing two otherwise similar notebooks, but at least AMD’s reference platform for Trinity delivers a great starting point. One other item we wanted to quickly touch on is system temperatures. We typically use HWMonitor and check temperatures of laptops under idle and load conditions. We did this with Trinity as well, but unfortunately the current version of HWMonitor doesn’t give us a lot of information. The only temperatures it reports are from the SSD and the HD 7660G graphics—there’s nothing about CPU core temperatures. That means we can’t provide much detail, other than to say that load temperature on the GPU topped out at 71C during extended testing, while the idle temperature was 39C. As usual, temperatures and noise levels go hand in hand, and the low 71C maximum GPU temperature matches up nicely with noise levels that never got above 37dB. It’s not the quietest laptop we’ve ever tested, and surface temperatures can get a little warm, but overall Trinity looks to be a good balance of performance and power requirements, which means quiet laptops are definitely possible. AMD’s Heterogeneous Computing with Trinity Conclusion: What Makes a Trinity? Introduction and Piledriver Overview Improved Turbo, Beefy Interconnects and the Trinity GPU Mobile Trinity Lineup Meet the AMD Trinity/Comal Prototype AMD Trinity General Performance AMD Trinity Gaming Performance AMD’s Heterogeneous Computing with Trinity AMD Trinity: Battery Life Also Improved Conclusion: What Makes a Trinity?